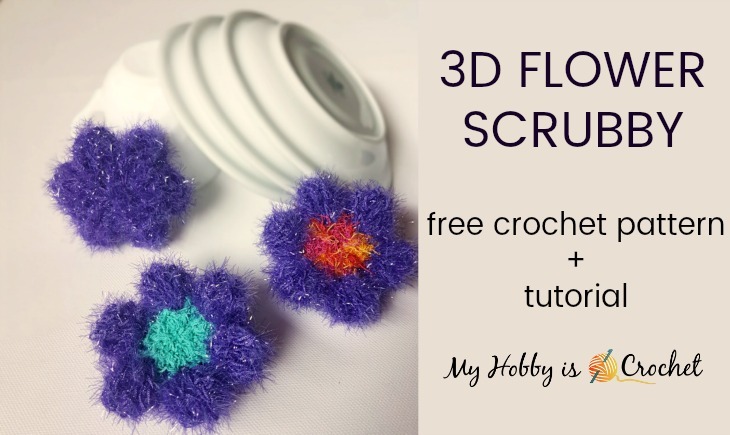 After creating the Dahlia Palm Scrubby, I've got the idea of making a smaller 3D Flower Scrubby. 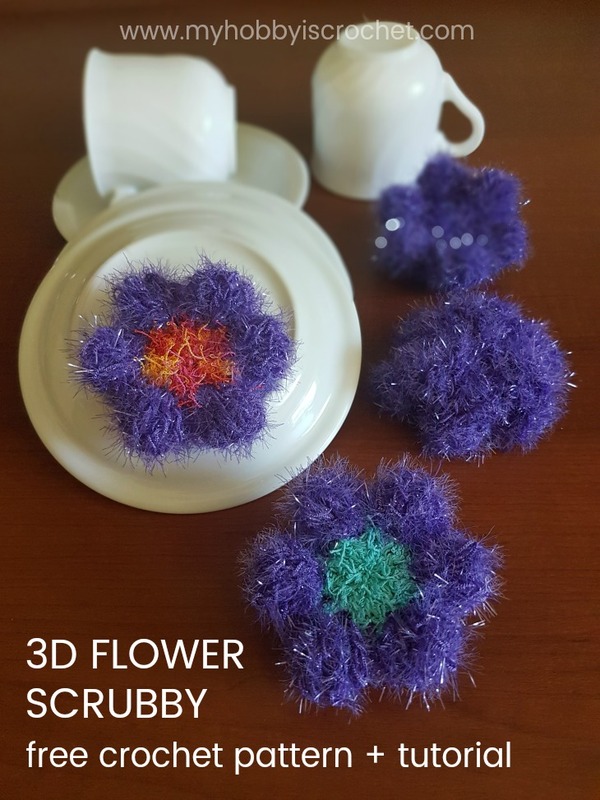 I have left the second layer of petals from the Dahlia Scrubby out and added additional decrease rounds to give it a nice 3D shape. 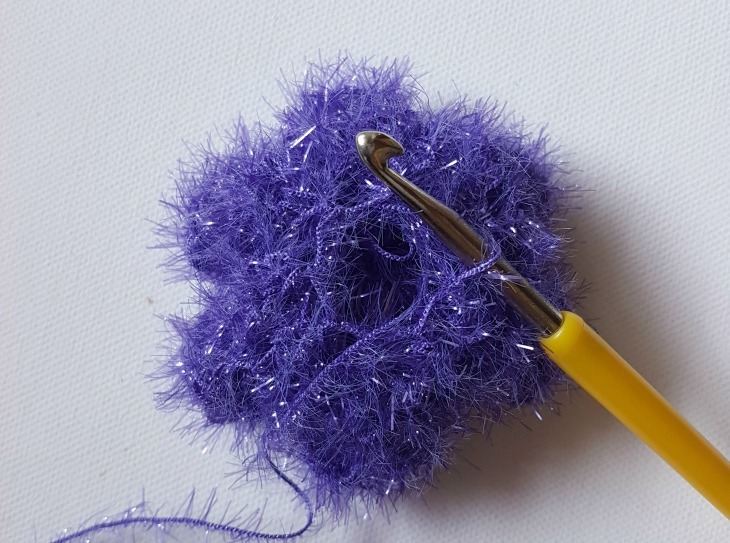 Click on the yarns to buy Scrubby Sparkle on Red Heart Yarn site! 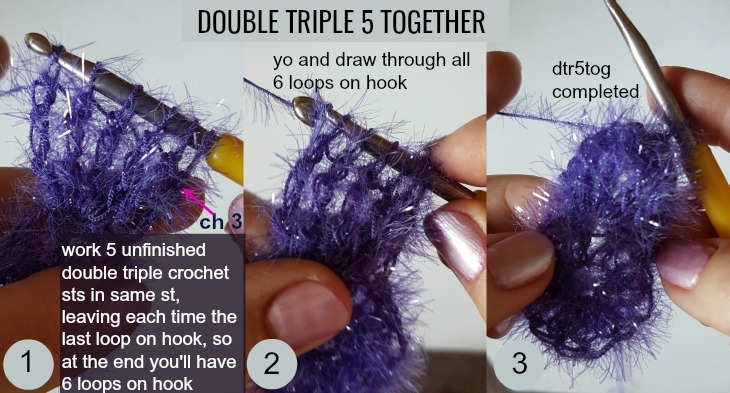 Dtr: double treble crochet: Yo hook 3 times, insert crochet hook in st, yo, draw lp through, [yo, draw through 2 lps on hook] 4 times. 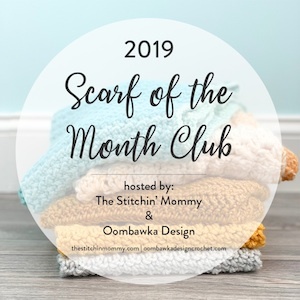 Insert the hook into the next stitch, yo and pull it through the stitch; you should now have 4 loops on your hook; Yo and pull through all 4 loops on your hook. 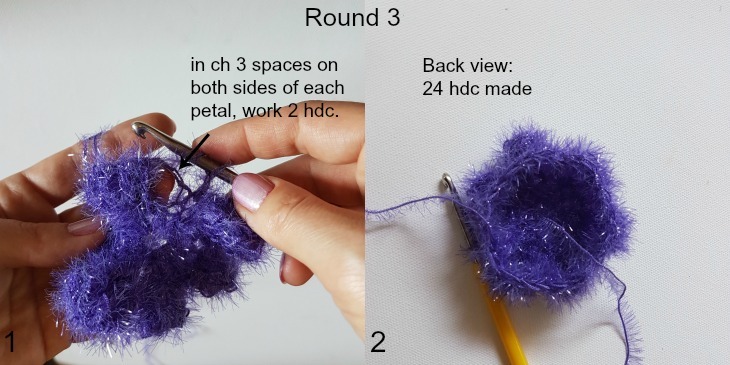 Watch this Video Tutorial for the hdc decrease by New Stitch a Day on Youtube! 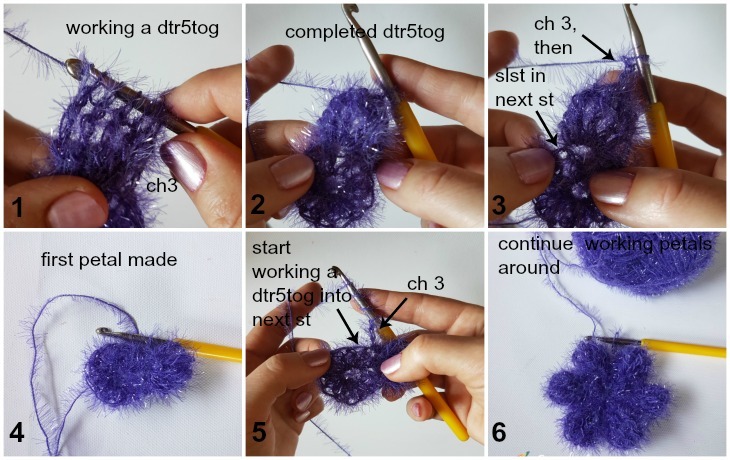 2) dtr5tog or double triple 5 together: [yo hook 3 times, insert hook in the stitch indicated in the pattern, draw loop through, (yo, draw through the first 2 loops, leaving the next loops on hook)x 3 times] x 5 times in the same stitch. You have 6 loops on the hook; yo, draw through all 6 loops on the hook. Round 1 (flower center): work 12 dc into ring, sl st to top of first dc. (12 sts) Pull yarn end tight to close the magic ring. Round 2: (petals): ch3, work dtr5tog in next dc, ch3, *slst into next dc, ch 3, dtr5tog in next dc, ch 3*, repeat from * to * 5 times, ending with a slst in the same st as the ch3 at the beg of round. You will have a small hole left in the center of the flower. Cut yarn leaving a tail that will be used for closing the hole. Fasten off. 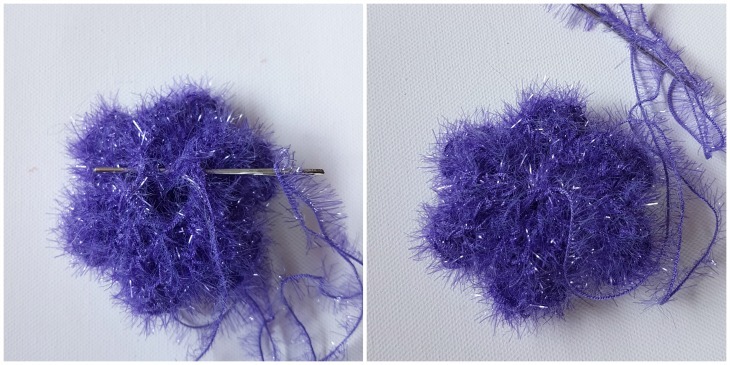 Tip: To give more volum to your flower scrubby, before closing the hole, you can fill it with Scrubby Sparkle yarn. Thread yarn needle with the yarn tail and weave yarn through ends of last round; pull the yarn tight to close the hole. 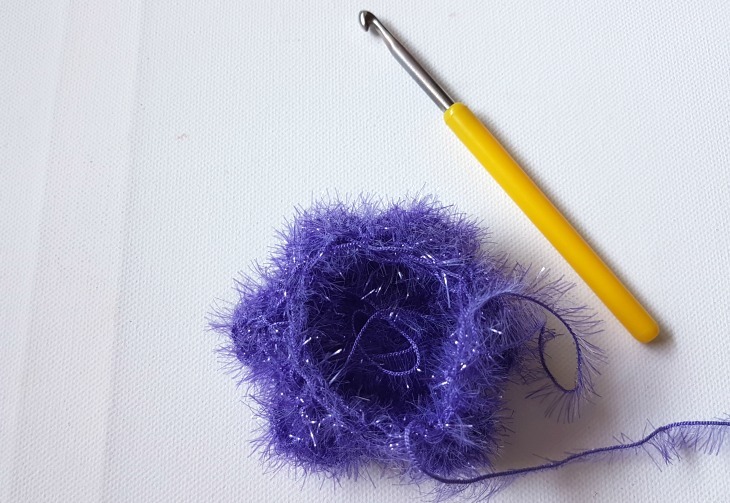 Secure by weaving the yarn through for a few more times, then fasten off, hiding the yarn end inside the flower scrubby.